The installation FILTER refers to flexible barriers, where some things can and others can not pass. I developed the concept for for the exhibition 'Verschanste Klanken' at C-Fordt Maarsseveen, a historical defense building which is part of the 'Hollandse Waterlinie'. In case of a threat, water was used there as a natural barrier to deny the enemy entrance to important areas. FILTER invites people to explore these flexible barriers, while exploring the system behind the installation. 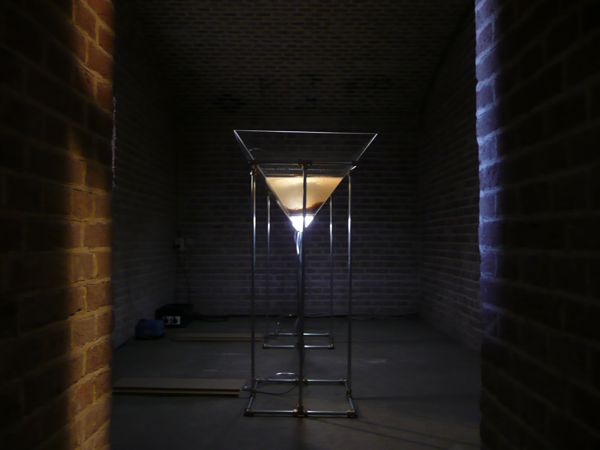 Increasing amounts of movement from the audience in the space symbolically form a growing 'threat' to the installation. As a defense-mechanism the water will bubble more violent an light will shine brighter. Every time a visitor passes the doorway, the reaction of the installation changes. FILTER controls water, sand and air to create alternating moments of light and darkness, bubbles and silence. Developed for C-Fordt Maarsseveen, for the exhibition 'Verschanste Klanken' by Fedde ten Berge. With programming support from Alex van Giersbergen (wtf0.nl).